My sister came over today for a photo shoot of the many fantastic costumes that she has sewn for her children over the years. I'm photographing them so she can start an online portfolio of her work (I'll let you all know when it's up because her work is amazing!). In the middle of the photo shoot, my sister tells me to turn around. And look at what I find behind us. Oh perfect....black, purple, and eerie yellow eyes. How cute! I'll keep an eye out for your sisters portfolio. The hat looks awesome from what I can tell! 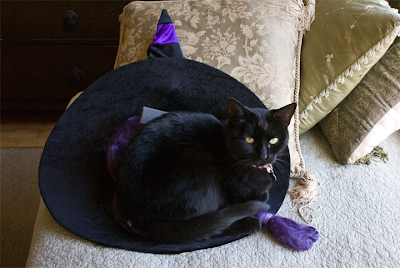 I think I read a book called Thomasina the Witch's Cat as a child, hold on I'll check Amazon! Wonderful pic worthy of Halloween cards. Thomasina is really a beautiful cat!!!! Oh Thomasina, you have made an excellent choice! THomasina is one smart cat! She looks beautiful next to purple. Can't wait to see the costumes. What a perfect picture for Halloween! She is a beautiful cat! You just triggered a memory. The Three Lives of Thomasina was one of my favorite Disney films when I was a little girl. This Thomasina is incredibly beautiful. I can't wait to see the costumes. Love that picture!! I guess she told you what she wanted to be for Halloween! That's really cute and just a teensy bit spooky. She's beautiful!